What is “time in range"? What is “automated insulin delivery"? Are Bigfoot's solutions the same as the system that Bryan Mazlish created for his family? Has Bigfoot considered concerns about smartphone security and performance? Do Bigfoot's solutions include glucagon? Can I order Bigfoot's products? When will they be available? I live outside the U.S. Will Bigfoot's solutions be available in my country? Will my health insurance cover Bigfoot's solutions? Can I participate in your clinical trials? Do you offer tours of Bigfoot’s lair? What does Bigfoot do with my personal data? Type 1 Diabetes (T1D), once known as Juvenile Diabetes, is an autoimmune disease, meaning that the body’s own immune system, for reasons unknown, attacks cells in the body that it shouldn’t. In the case of T1D, the immune system destroys cells in the pancreas that produce a hormone called insulin that is necessary to convert the food you eat into energy. People with T1D must take insulin for the rest of their lives, either through a pump or daily injections, in order to prevent their blood glucose levels from rising too high. Though often diagnosed in childhood, T1D can be diagnosed at any age. It is an intensely managed condition, requiring hundreds of decisions a day about how much insulin to take, how to respond to blood glucose levels, how to make choices about the food you eat and the activities in which you participate, just to name a few. The roots of Bigfoot’s founding team stem from their personal experience with T1D, and it is their personal and professional mission, as well as many of the people working at Bigfoot, to bring to market our automated insulin delivery solutions to make living with T1D easier and safer. Type 2 Diabetes (T2D) is a metabolic condition in which the body is either unable to use the insulin made by the pancreas (known as insulin resistance) or in which the pancreas loses the ability to continue to produce insulin at the level that the body needs. A progressive disease, T2D often requires adjustments to therapy over time, which often includes the addition of insulin. According to recent statistics from the CDC, more than 30% of people with T2D in 2011 included insulin in their daily treatment regimen. T2D may be diagnosed at any age and it is the most common type of diabetes, affecting roughly 95% of people with diabetes. Bigfoot's automated insulin delivery solutions are intended to help those with T2D who require insulin to optimize their insulin dosing regimen in the simplest, smartest way possible. Hypoglycemia, or low blood sugar, occurs when there is not enough glucose in the bloodstream to fuel the cells of the body. Hypoglycemia is considered any glucose level below 70 mg/dL (3.9 mmol/L). It can be caused by too much insulin (or other diabetes medication) or by activity, such as exercise. Symptoms may include shakiness, sweatiness, headache, blurry vision, hunger, palpitations, and confusion. Severe hypoglycemia may result in loss of consciousness, seizures, brain damage, and in rare cases, death. Severe hypoglycemia, such as a seizure that requires a hospital admission, results in a huge cost to the person with diabetes as well as the healthcare system. Bigfoot’s automated insulin delivery solutions intend to significantly reduce the risk of severe hypoglycemia, as well as the costs associated with it. Hyperglycemia, or high blood sugar, occurs when there is too much glucose in the bloodstream. A number of factors can cause hyperglycemia in people with diabetes, including but not limited to lack of insulin, food that has been eaten, stress, illness, and hormones. Symptoms may include thirst, frequent urination, hunger, or fatigue. Severe hyperglycemia can result in a condition known as diabetic ketoacidosis (DKA), which may lead to coma, kidney failure, a problem with heart rhythm, heart attack, muscle breakdown (rhabdomyolysis), and in rare cases, death. Similar to severe hypoglycemia, severe hyperglycemia or DKA has significant costs to the person with diabetes and the healthcare system. By leveraging data and automation, Bigfoot automated insulin delivery solutions intend to significantly reduce the instances of severe hypoglycemia and its related costs. “Automated insulin delivery” is the term we use at Bigfoot to describe how a system uses information about glucose to change the delivery of insulin to assist in reducing hypoglycemia and hyperglycemia, increasing time spent in a healthy, safe, target glucose range. Referred to in the media as an “artificial pancreas,” an automated insulin delivery system is not an implanted device and not a biological cure for diabetes. Our insulin pump-based investigational system in development at Bigfoot Biomedical is not the system that Bryan Mazlish created for his family. The Mazlish system was a proof-of-concept system that has inspired the work we do today, especially the real world experiences that Bryan’s wife and son have had while living with and wearing their system for over five years. Security is a top priority of Bigfoot. Our team members have significant experience across consumer technology, enterprise software, and the regulated medical device space, so unlike a traditional medtech company, we are approaching questions of security - as well as concerns about the many ways in which we live and interact with consumer tech devices like smartphones - thoughtfully, working in coordination with FDA to ensure that concerns are addressed through our approach. We look forward to the day that the U.S. Food & Drug Administration (FDA) approves glucagon for use in an infusion pump and this option becomes available. 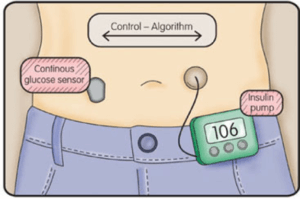 Currently, there is no FDA-approved glucagon available for administration via an infusion pump, and there are many unanswered questions around the chronic administration of glucagon, as well as the use of glucagon in a closed loop system. In the meantime, we are maintaining a singular focus on developing a safe, simple, reliable, and accessible insulin-only system, that is available ASAP. We’re preparing for a pivotal trial in the US, details of which we will announce in late 2018 or early 2019. After the completion of our pivotal trial, we’ll be in a position to submit our solutions to FDA for approval, and pending their review and approval, we will celebrate the commercial launch of our automated system, anticipated for 2020, with our connected injection system launching along a similar timeframe. While we regret we can’t be an option for you now, our service model is being designed with the intent to make it fairly painless to transition to begin using our products and services, as Bigfoot's vision is to deliver our solutions as a monthly subscription with a single co-pay rather than the traditional model of a large upfront purchase. While our initial launch is planned for the U.S., we have plans to bring Bigfoot's solutions to countries outside the United States. A timeline for these countries has not yet been announced. One of the founding goals of Bigfoot Biomedical was to design comprehensive solutions that would be cost-effective for patients, healthcare providers, and insurance payers. Until we have FDA approval to market our products, it is too early to predict which payers will support Bigfoot's solutions. You can rest assured, however, that we are striving for broad coverage for all our solutions. We have selected, and will continue to carefully select, some of the finest clinical trial investigators and research sites in the world. We leave participant recruitment and selection entirely in the hands of these outstanding investigators and research sites. If you would like to find out more about participating in a clinical trial, please visit clinicaltrials.gov to find trials for which you or your family member might be eligible. You can also make sure that centers near you that do this kind of research have your contact information in the event that they're selected for our trials. At this time, we do not offer tours of Bigfoot Biomedical’s headquarters. While the work we do is exciting and life-changing, watching us do it is considerably less so.